Plus: Panatha USA against Williamsburg, NYPD aim to win versus the Reds and Beyond FC sees Iberia this weekend in the Cosmo League’s 2nd Division. Japan going all or nothing against promotion favorites! Polonia Gwardia NY will play against FC Japan this Saturday with the Polish side seemed to have confidence in an upper-half finish this season. Tough times for the Japanese as they are finding it hard to find wins this late with 2 wins, 2 draws and 9 losses in 13 matches, even having their reserve side faring just as worse at bottom of the Southern Reserve Division with no wins all season. Against this Polonia side who has only concede 13 goals all season, they will hope for their #9 up front Kenji Nakamura to put the ball in the back of the net throughout the 90 minutes. After Saturday’s fixture, they will spend the rest of the season playing against the likes of Beyond FC and Stal Mielec NY. Polonia Gwardia are still in 2nd place in the South, just 3 points away from promotion favorites Hoboken FC 1912. Having picked up nothing but wins in their last 6 games, they look to end the season as the team to race with Hoboken until the end of the season for promotion. FC Japan against Polonia Gwardia NY at Randall’s Island Field #75 with kickoff starting at 8:00pm EST this Saturday, May 5th. KidSuper Samba look to take top spot against leaders Spring Valley! 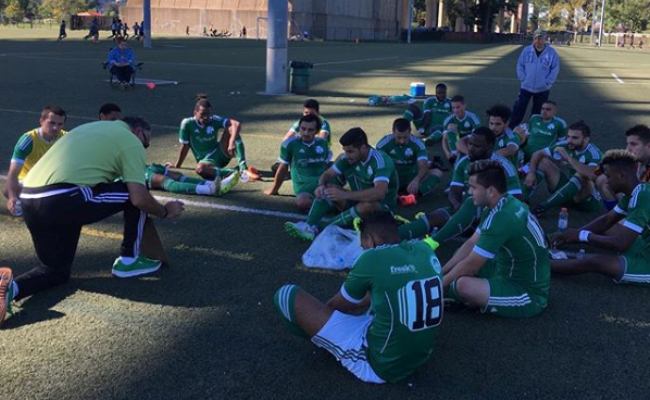 Valley haven't picked up a loss since they were forced to forfeit to Samba AC back in November. They will be looking to keep Ebrima Jallow and company quiet the whole 90 minutes from the back and lead by example from up front. Starting out with the Northern leaders FC Spring Valley, they are coming back from a hard-fought 2-2 draw at the North Rockland Soccer Complex against mid-table Manhattan Celtic. Roberto Garcia and Omar Aragon were the Valley’s goalscorers while they couldn’t prevent their opposition from creating chances and scoring, Celtic scored two through Jamie Reilly and Marco Charnas. Samba did not play last week but have been undefeated throughout the month of April, scoring 8 and allowing 5 in 2 matches. Samba have been seeing their stars Ebrima Jallow and Alhoussain Bah repeat their name among the goalscorers’ list but have a great team camaraderie thanks to players like forward Yankuba Janneh and midfielder Dylan Cope. KidSuper Samba will play FC Spring Valley at Randall’s Island Field #10 with kickoff starting at 7:00pm EST this Sunday, May 6th. It’s the green-clad Greeks vs. the green & gold of Williamsburg International FC with Panatha looking to beat their unfortunate form against a side who has lost 2 consecutive matches going into May. The Greeks haven’t picked up a win in over 6 matches - 5 losses and a single draw. Failing to get past any of the top 5 teams in the South this season, Panatha are facing Williamsburg, looking to tighten up their defense or risk another thrashing similar to their first league encounter of the season back in early October where the Greeks lost 8-1 to their opponents. Facing only upper-half Southern teams for the rest of the season, Panatha Head Coach Christoforos Petropoulos will have his fingers crossed for a win in his favor on Saturday. The Finest In Blue against Manhattan’s Reds! Central Park Rangers’ Reds will face-off against NYPD FC with both teams looking for wins for differing reasons. The Rangers aren’t anywhere close to having a poor season but in the CSL 2nd Division, they have been hovering in mid-table up North for quite some time with very few games left to go to secure a higher position. What they can boast is their impressive Flamhaft Cup run now into Round 5 of the tournament where they will face Brishna this Sunday, same day as their NYPD encounter. Reliant on letting their opposition play the game and break on the counter, they will look to players like Emilio Cordero and Kevin Zalewski for inspiration and a healthy win. “The City’s Finest”, however, haven’t won in 4 matches and now sit in 7th place in the North. NYPD’s encounters with CPR and Bronx Supreme FC will be their last matches of the season and might not be enough to send them towards the top half of the table. Club Deportivo Iberia are stuck in 5th place and will go for nothing less than a victory against strugglers Beyond FC to finish high up the Southern Division. Beyond FC, joint least points in the league with Panathinakos at 7 in 13 matches, are looking to win all their matches to improve their form and finish away from the bottom for the first time since their arrival in the league in 2012. If player manager Paul Nitto can convince his squad to put in a shift against the two-time John Kilby Cup champions, then it will be considered one of their best seasons in recent seasons. Club Deportivo have been prospering at the performances of forward Marcello Russo for their team, the scorer of 7 goals in 11 matches and playmaker Ivan Hernandez with 4 assists in 9 competitive matches.